City in the Spanish province of Cadiz. It had a Jewish community with a separate Juderia as early as the time of the Moors. When Alfonso X., the Wise, conquered the city in Oct., 1264, he assigned houses and lands to the Jews. The Juderia, which was located near S. Cristobal street and extended along the city wall, included ninety-six houses, large and small, and had two synagogues and two "casas de la merced," institutions for aiding and housing the poor. Near one synagogue were the "casas del reab" (houses of the rabbi); Don Todros, father of Don Yuçaff, is mentioned as being the occupant in 1264. Near the other synagogue was the house of Rabbi Yuçaff. 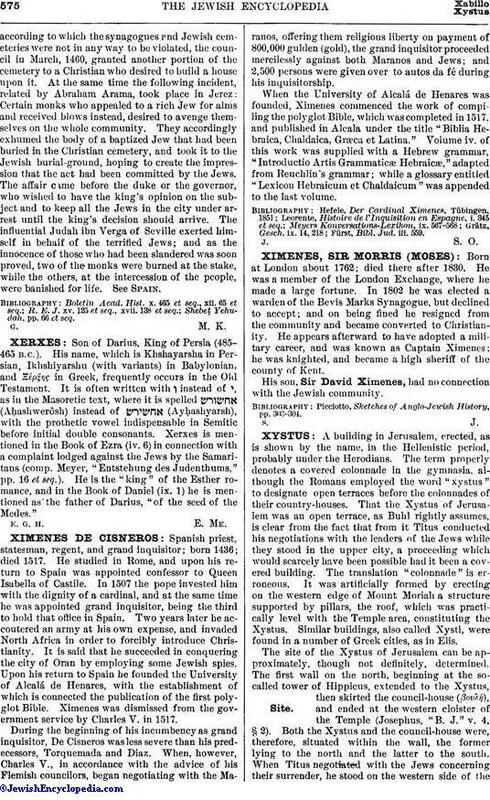 Upon the conquest of the city the following persons received houses by command of the king: Don Yehuda Mosca (as he is several times expressly called in the list drawn up in 1338), who made translations from Arabic into Spanish for the king; the "almoxarife" Don Mayr, or rather Mür de Malhea, and his son Çag (Isaac); Çimha (Simḥah) Xtaruçi, whose father lost his life and the whole of his large fortune during the rebellion of the city; Don Vellocid (Vellecid), "ballestero del rey a caballo"; Solomon Ballestero; and Axucuri Ballestero—the last three being in the king's army. Among the richest and most influential Jews in Jerez were the following: Çag aben Açot, who was the representative of the community at the repartition of the taxes in 1290, and his relatives Judah aben Açot, Bonet aben Açot, Abraham aben Açot; likewise Samuel de Cadiz, Jacob Castellano, Çag aben Colmiel or Calamiel, Samuel Barrach, Levi de Faro, Abraham Saltos, Vellido de Castro, and Abraham de Carrion. The Jews of Jerez engaged in business. One Yuçaff Alcaçabi, who had laid in large quantities of salt pork in his houses and lost everything he possessed, because he had favored the Moors, did not receive the house which had first been assigned him. The Jews engaged in viticulture also, Jerez wine being the most valued wine of Spain. There were also tailors (Cedillo Alfayate is mentioned), rope-makers (Çag el Cordonnero), and shoemakers among them. The Jerez Jews, who in 1294 paid King D. Sancho IV. 5,000 maravedis in taxes, were freed by the king from the payment of tolls throughout the kingdom, and were assured of the same favor as was enjoyed by Christians and other inhabitants of the city—a privilege which was confirmed by Kings Fernando IV. and Alfonso XI. (Dec. 30, 1332). 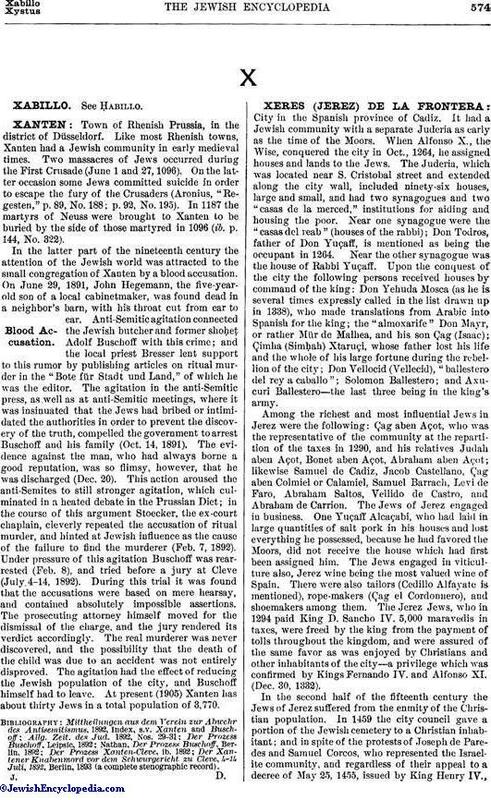 In the second half of the fifteenth century the Jews of Jerez suffered from the enmity of the Christian population. In 1459 the city council gave a portion of the Jewish cemetery to a Christian inhabitant; and in spite of the protests of Joseph de Paredes and Samuel Corcos, who represented the Israelite community, and regardless of their appeal to a decree of May 25, 1455, issued by King Henry IV.,according to which the synagogues and Jewish cemeteries were not in any way to be violated, the council in March, 1460, granted another portion of the cemetery to a Christian who desired to build a house upon it. At the same time the following incident, related by Abraham Arama, took place in Jerez: Certain monks who appealed to a rich Jew for alms and received blows instead, desired to avenge themselves on the whole community. They accordingly exhumed the body of a baptized Jew that had been buried in the Christian cemetery, and took it to the Jewish burial-ground, hoping to create the impression that the act had been committed by the Jews. The affair came before the duke or the governor, who wished to have the king's opinion on the subject and to keep all the Jews in the city under arrest until the king's decision should arrive. The influential Judah ibn Verga of Seville exerted himself in behalf of the terrified Jews; and as the innocence of those who had been slandered was soon proved, two of the monks were burned at the stake, while the others, at the intercession of the people, were banished for life. See Spain. Shebeṭ Yehudah, pp. 66 et seq.